Meet Clark Garner, the owner of Triple G Farm in Muscadine, Alabama, out of the Carrollton Georgia Complex. Garner has only been a poultry farm owner for two years and already his dedication and commitment are paying off. He has built four state-of-the-art 66×600-foot chicken houses, where he grows 60,000 chickens per house, and produces six to seven flocks annually. At 28 years of age, Garner is young for the poultry game, Stewart says. Farmers are generally in their 50s. The farming industry simply isn’t getting the influx of young farmers it used to get. Poultry farming is in Garner’s blood. His farm is named Triple G Farm to pay homage to the fact that he’s a third-generation poultry farmer on both sides of his family. His parents, Bobby and Patricia Garner, are cattle and poultry farmers. Both sets of his grandparents were also chicken farmers. Garner took a brief detour after high school into the car industry. He did auto body work and then opened up his own wholesale auto dealership with his father. When the economy took a turn for the worse, the auto industry took a hit. Simultaneously, Garner met his wife Janice, and they longed to create a life with more financial stability to prepare for a family. “The car dealership venture with my dad, that went pretty well, but the economy kind of shot it down and I had met my wife in the meantime. I was looking for a little more family-friendly, steadier income. The cars were okay, but you might make $10,000 this week and lose $4,000 next week. It was a little bit scary,” Garner says. Garner took out a loan for a hair over $2 million to build four state-of-the-art poultry houses. The young couple is focused on getting their ducks (or chickens, in this case) in a row before they start a family. Like most of their extended family, they live in a house on their parents’ 400-acre farm, adjacent to their 80-acre poultry farm. Janice Garner is now learning the poultry farming industry full time. Initially intimidated by the operational aspects of the farm, such as running the high-tech equipment, she prefers the hands-on labor approach. As she learns more, Garner expects that she will want to take over more aspects of the operations. The couple serve as youth directors at West View Baptist Church in Tallapoosa, Georgia. They enjoy the flexibility of chicken farming, believing that it gives them more time to spend with their family and in church activities. One thing Garner says he values about growing up on a farm is that it made him a jack-of-all-trades. “You learn how to do a little bit of everything with the types of skills you learn on a farm. You can always find a job, if you want one,” Garner says. He takes side jobs doing welding fabrication in local factories, leveraging a skill he learned as part of growing up on a farm. Every Pilgrim’s grower is an independent contractor. Though they get paid per pound of bird produced, there is extra money for growers who grow the healthiest chickens with the least amount of feed. 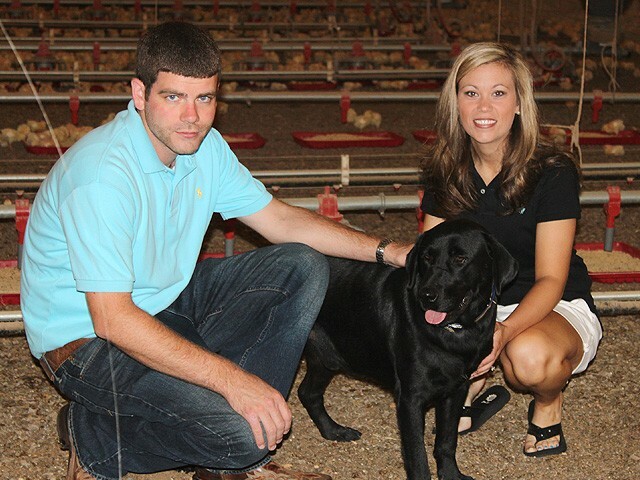 Garner says he enjoys the competition involved in chicken farming.